More than any other school in the 20th century, it is Black Mountain College (BMC) that reached the height and set the standard for the apex of art and innovative education in the United States. And presently touring the nation is the largest and most comprehensive exhibition and presentation of the school’s work products and sweeping global legacy. 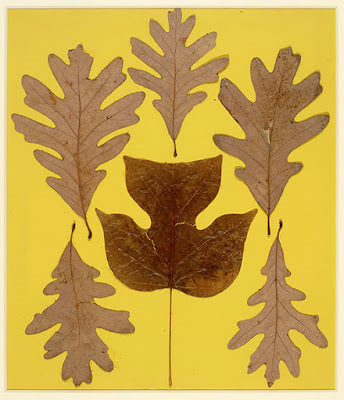 Josef Albers, Leaf Study IX, c. 1940, leaves on paper, 28 x 24 ¾ inches. (c) The Josef and Anni Albers Foundation/ Artists Rights Society New York. Photo: Tim Nighswander/Imaging 4 Art. The show is entitled Leap Before You Look: Black Mountain College 1933-1957. It is the curatorial brainchild of the Institute of Contemporary Art/Boston. BMC was founded by John A. Rice, who prior taught at Rollins College in Florida. BMC was a parallel to and an inheritor of many principles and players of Germany’s Bauhaus school, which closed in 1933. The same year BMC was opened.